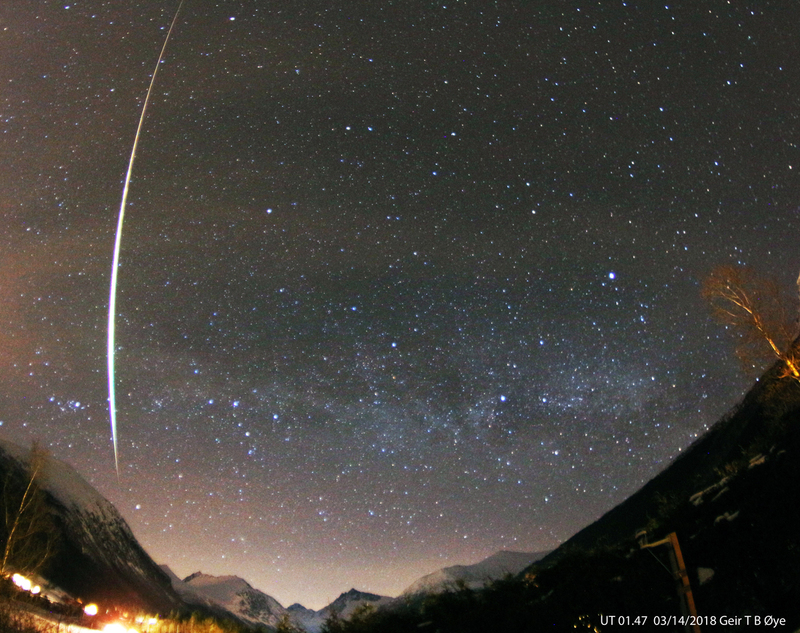 A bright Leonid meteor on a bright moonlit sky. November 21, 2018. 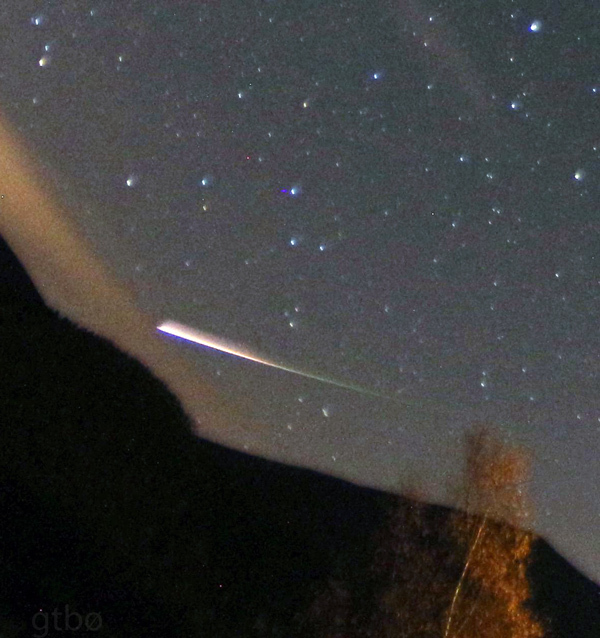 This meteor was photographed traversing the sky at 00.28 local time on November 21, 2018. This entry was posted in Uncategorized on November 21, 2018 by admgeiroye. 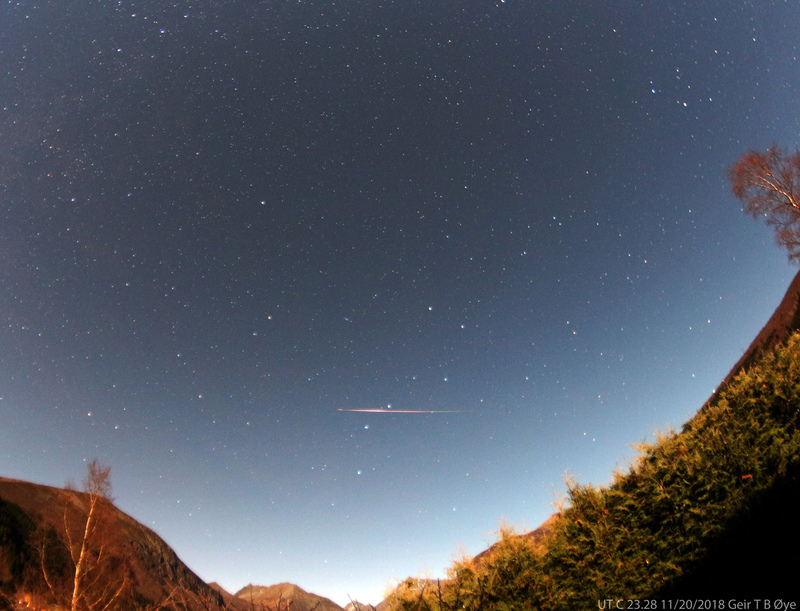 Bright meteor / fireball captured on October 11, 2018 UT 23.21. Photo details: Canon 650D, Vivitar 8 mm fisheye lens. This entry was posted in Astronomy and tagged fireball, ildkule, meteor, norge, norway, ørsta on October 15, 2018 by admgeiroye. 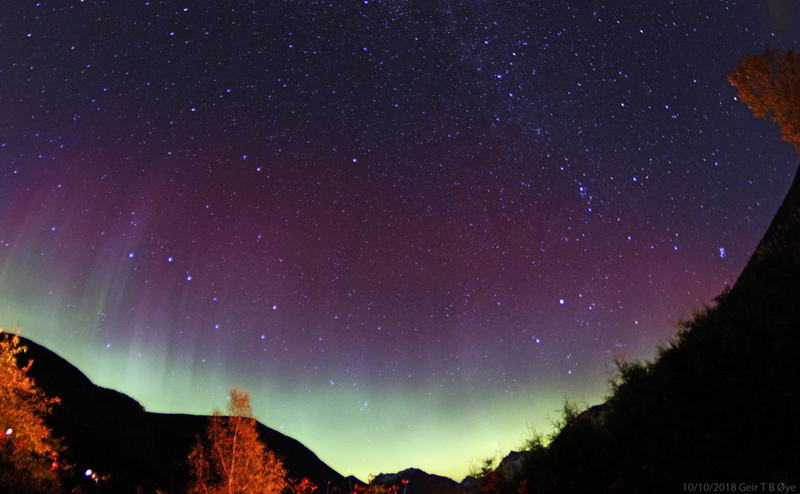 Aurora Borealis on October 10, 2018. A nice display of Northern lights on the evening of October 10, 2018. The verdant wall above the mountains lasted a few minutes. 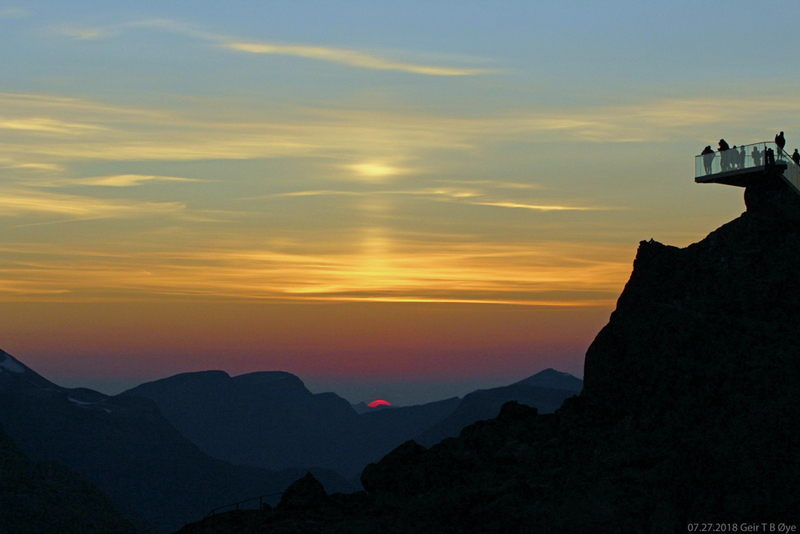 This entry was posted in Astronomy on October 10, 2018 by admgeiroye. 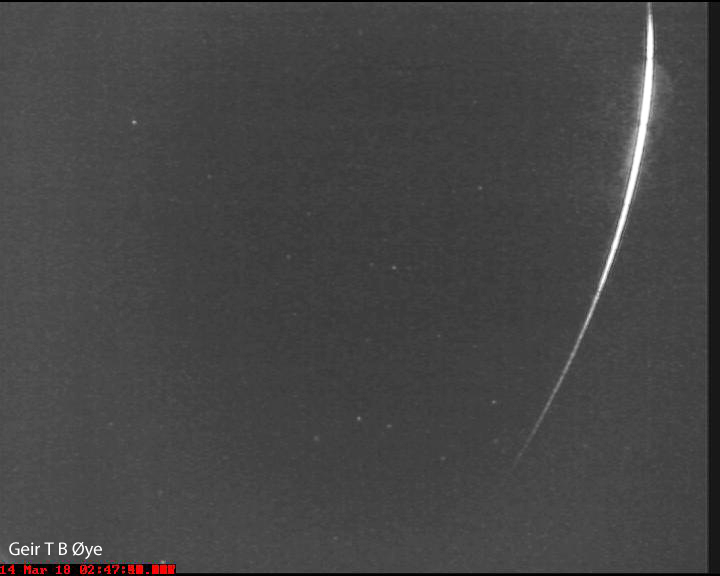 This bright meteor was captured by my Mallincam Allsky Camera in the early hours of September 8, 2018. Timestamp is local time. This entry was posted in Uncategorized on September 10, 2018 by admgeiroye. The International Space Station crossing a bright moonlit sky. March 31, 2018. 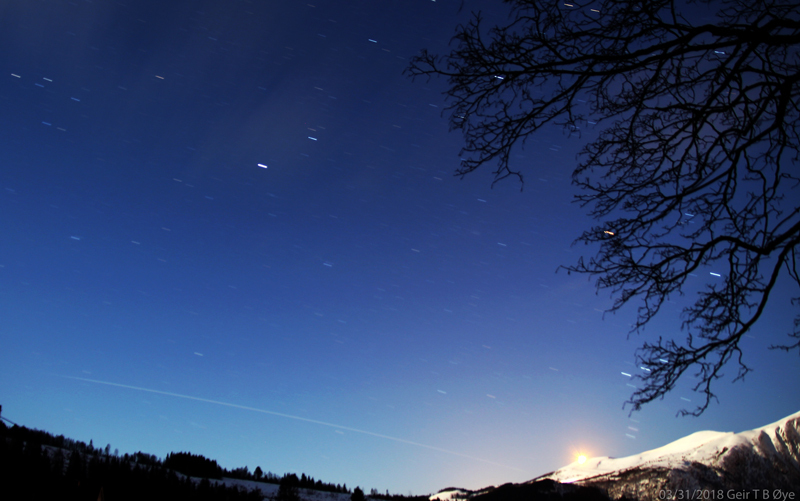 The International Space Station was visible over Ørsta, Norway on March 31, 2018. 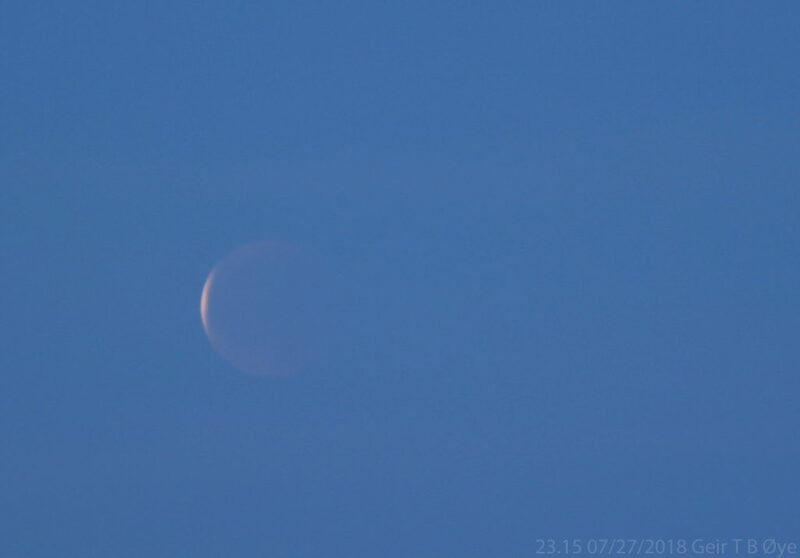 This entry was posted in Astronomy on April 1, 2018 by admgeiroye. This bright fireball streaked the sky at about UT 01.47 on March 14, 2018. The bright meteor was captured by a dslr and a MallinCam Allsky camera from Ørsta, Norway. 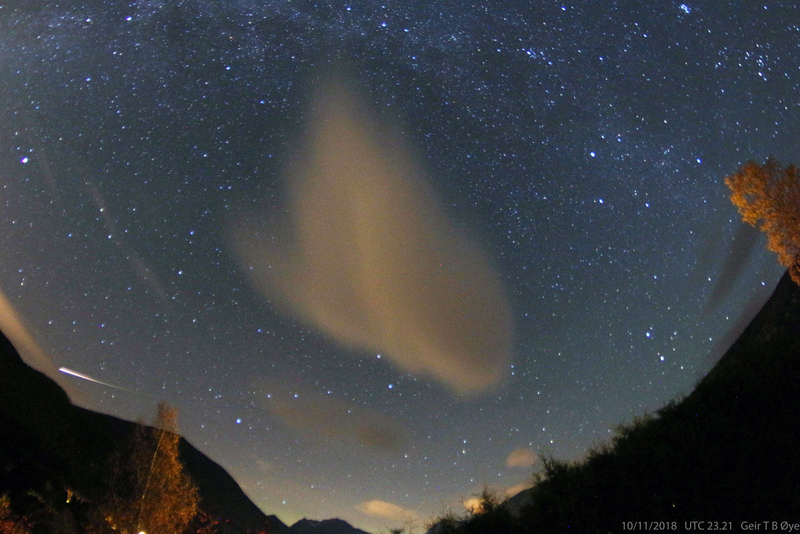 Photo details: Canon 650D, Vivitar 8 mm fisheye lens, ISO: 1600, exp: 58,3 seconds. Ildkule over Sunnmørsalpene. 14. mars, 2018. 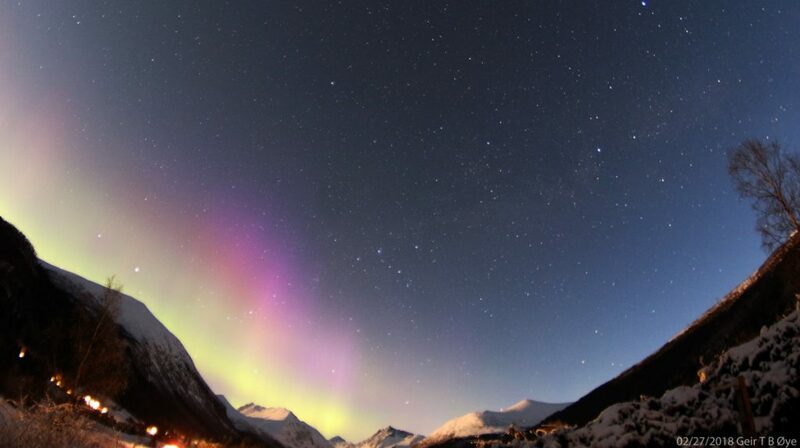 This entry was posted in Astronomy and tagged eldkule, ildkule, ildkule over sunnmørsalpene, sunnmøre, ørsta on March 14, 2018 by admgeiroye. Mercury and Venus. March 10, 2018. 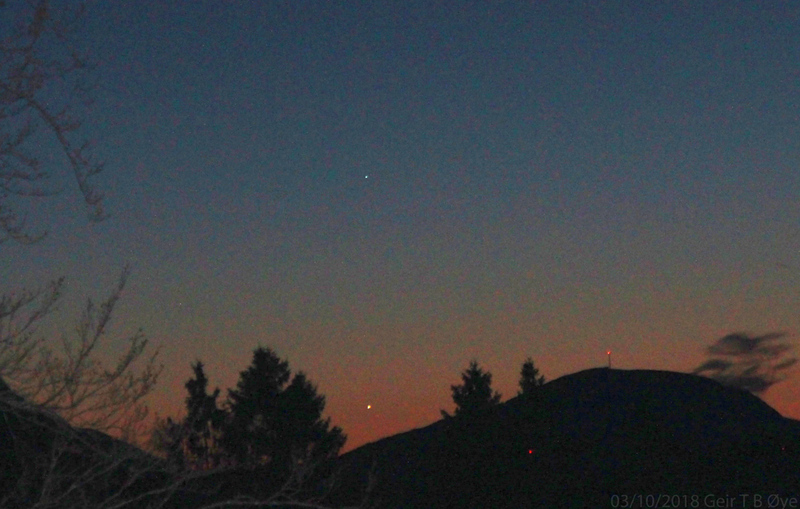 The innermost planets (Mercury and Venus) shines nicely after sundown. This photo was taken on March 10, 2018. This entry was posted in Astronomy on March 11, 2018 by admgeiroye. 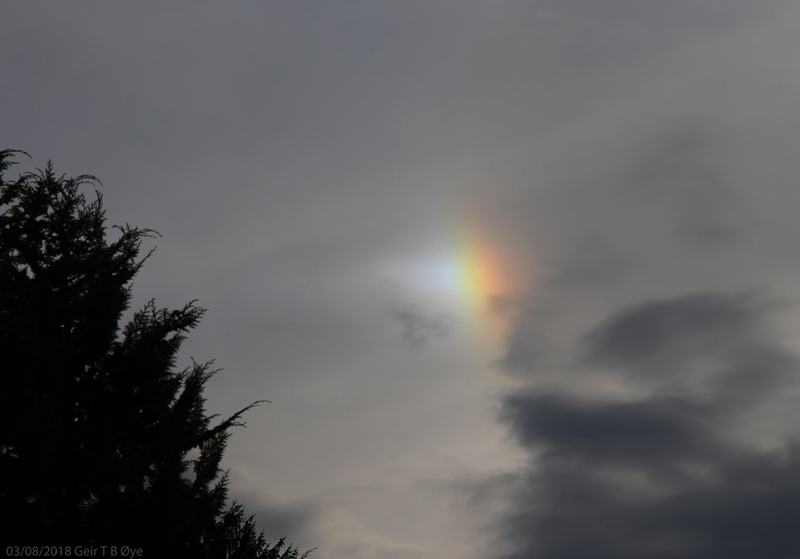 A bright and colorful sundog emerged between the clouds on March 8, 2018. This entry was posted in Atmospheric Optics on March 8, 2018 by admgeiroye. Aurora Borealis in the early hours of February 27, 2018. 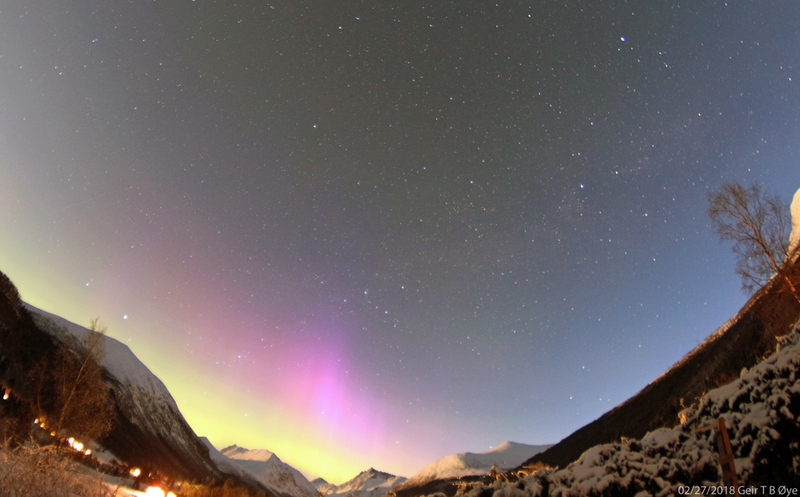 Curtains of colorful aurora borealis over the moonlit mountain peaks. 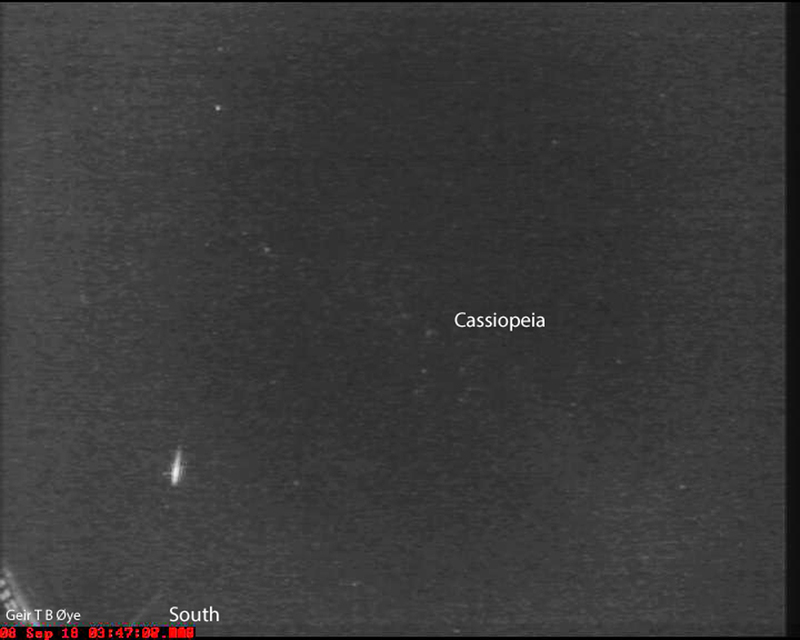 Photographed at about UT 04.48 on February 27, 2018. 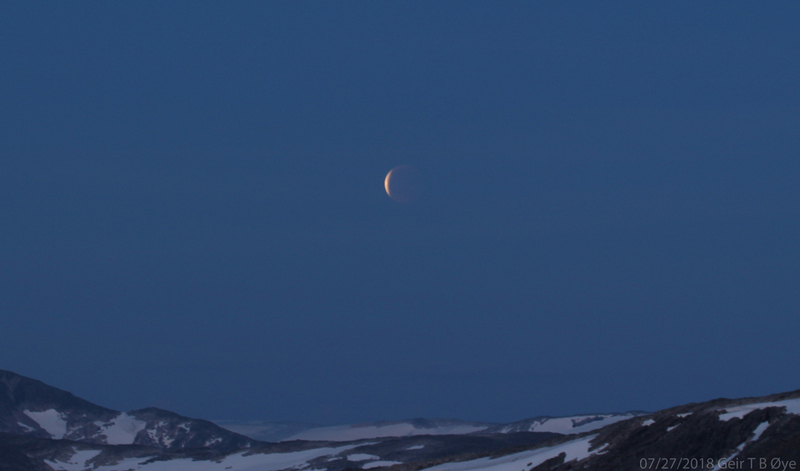 This entry was posted in Astronomy on February 27, 2018 by admgeiroye.